I am honored to announce my performance as part of the 2017 Regional Convention of the American Guild of Organists. This year’s convention features influencial artists of our times including Craig Cramer, Nathan Carterette, Nathan Laube, and the Cleveland Baroque Orchestra “Apollo’s Fire”. The only piano recital of the convention, this concert celebrates the inter-relatedness of piano and organ, both part of the keyboard instrument family. 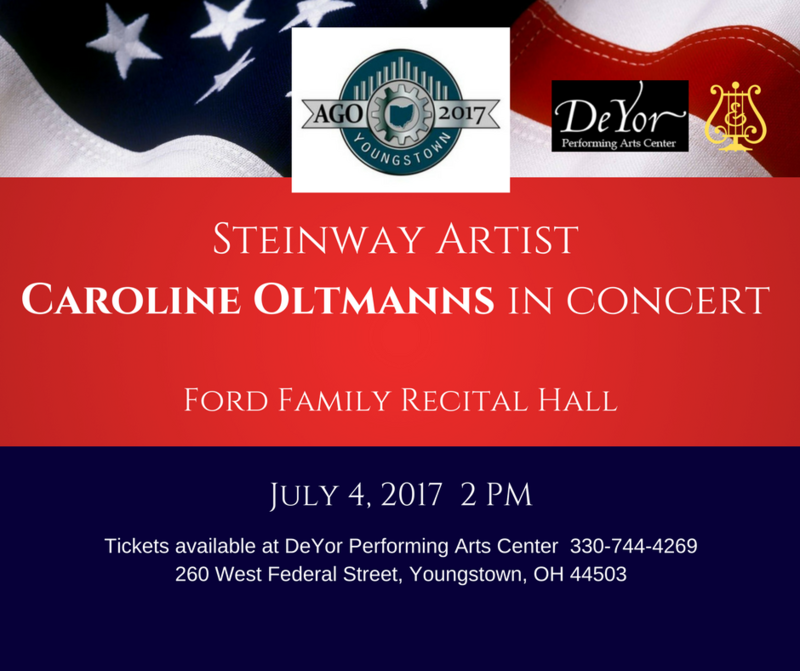 Ford Family Recital Hall in Youngstown, Ohio features two magnificent Steinway Concert Grand pianos, and I am looking forward to selecting my performance instrument with the concert program in mind. My focus in programming a concert for this event was the concept of sources of sound. The organ relies on wind blowing through pipes to create sound. I felt immediately intrigued by the idea of this invisible phenomenon, and built a program around the concept of wind. Works by Couperin, Chopin and Schumann feature different aspects from breeze to storm. What a brilliant opportunity to include Debussy's "Feux d'artifice" (fireworks) paying special tribute to the celebration of the July 4th holiday!